Choosing the right fence can be as difficult as choosing a baby name. Okay…maybe not that difficult, but you get the idea. There are so many options to choose from. First you have to pick a material: wood, vinyl, aluminum, or chain link. They you have to pick a style: picket, privacy, etc. Sheesh! I am getting stressed just thinking about it. Fortunately, Mid-Atlantic Deck and Fence Co. is here to help. We give you the information you need to make a well-informed decision. A decision you can be confident in. Several weeks ago, we outlined the benefits of vinyl fences. This week, we are going to take a closer look at what aluminum fences have to offer. Wood fences and wood decks have been a favorite of Marylanders for many, many years. Still, some homeowners are not a fan of the annual maintenance. After all, only Tom Sawyer can make painting a fence seem like fun. So wood is out. That leaves vinyl and aluminum. And while you like the low maintenance aspects of vinyl, you want a more traditional look and feel. You want an aluminum fence. An ornamental aluminum fence is one of the best ways to enhance the security of your property. These fences provide your home with an elegant curb appeal unmatched by other fencing materials. Because of all this, a new aluminum fence is a great way to boost home value, with a return on investment (ROI) around 65%. 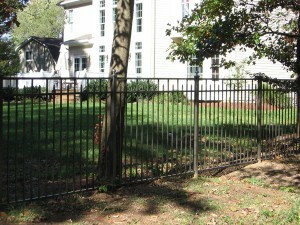 Mid Atlantic Deck and Fence has been installing high quality aluminum fences throughout Maryland since 1987. We are one of the only fencing companies in the state that custom designs, builds and installs all of our own fences. But don’t take our word for it. Please stop by and visit our new 10,000 square foot facility located at 800 Rt. 3 South in Gambrills, Maryland, the largest indoor showroom in the state. Please contact us today so we can begin to design the perfect out door environment that meets your needs, fits you budget, and compliments your home. If you have any questions about Aluminum Fence Installation in Maryland, please contact Mid Atlantic Deck & Fence (MAD Fence) today by clicking here or calling 1-800-833-9310. You can also follow us on Facebook and Twitter as well.